The workforce of Cook Masonry has an esteemed history of performing mortar repairs all over Yorkshire as well as internationally. We pride ourselves on being able to specify suitable repair mixes from traditional materials. However, we also work with a number of proprietary mixtures upon request. We are able to provide a range of different armature constructions (stainless steel, carbon, ceramic etc.) to suit all situations. 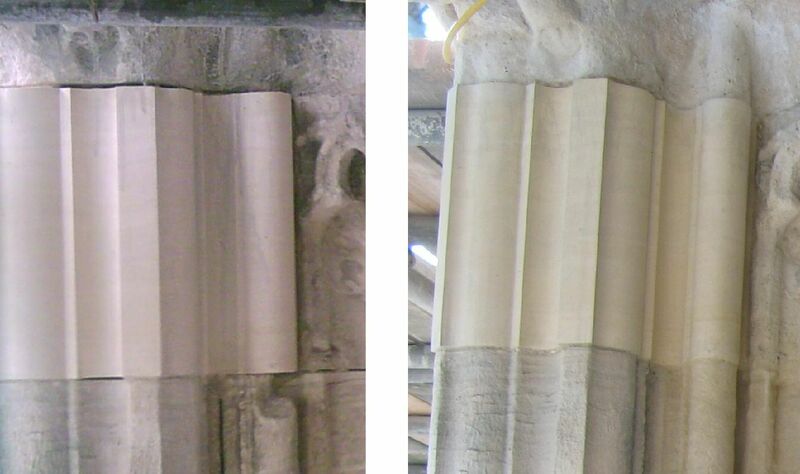 As a result of our in depth understanding of our materials, we are often able to restore details to even the most severely decayed stones. As such, we are commonly asked to undertake tasks which are considered to be beyond the abilities of most companies who often operate with a rudimentary knowledge of proprietary mixtures. Unless advised otherwise, Cook Masonry will always seek to find a mix that is compatible with the substrate stone. The use of a suitable lime based mortar will ensure that the permeability of the repair does not exceed that of the host masonry. This serves to promote the longevity of both the stone and the mortar repair. Wherever appropriate, the aesthetic of our mortar repairs is important to us and we will be able to provide a repair that should be inconspicuous to the casual onlooker. If you would like any additional information regarding our mortar repair services or would be interested in receiving a no obligation quote then please do not hesitate to contact us.